Distressing news out of spring training on Thursday afternoon for the San Francisco Giants when the left arm of right fielder and portable funhouse Hunter Pence was broken when he was hit by a pitch. He’s expected to be out six to eight weeks. The immediate problem is that nobody on the Giants knows how to play right field at Phone Company Park like Pence does. He hates to take days off, which means that no one else has had a chance to learn the position, which means there is no comfortable secondary option to patrol Triples Alley. I’m pretty sure that Yasiel Puig of the Los Angeles Dodgers has played right field in San Francisco more often than anybody currently on the Giants roster. So that’s an issue. 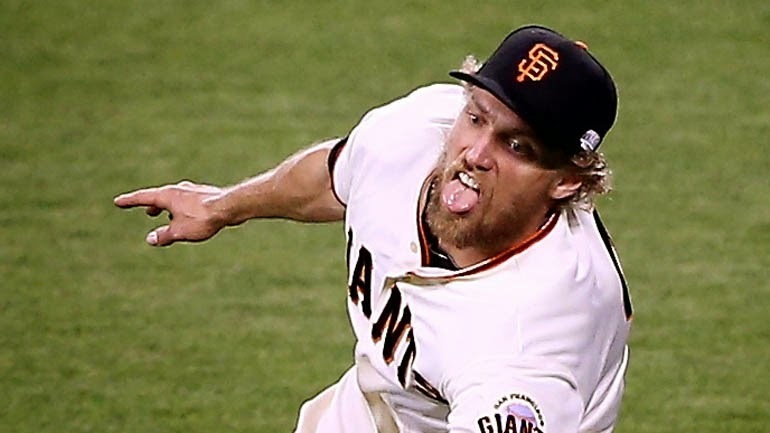 The secondary problem is the incalculable “clubhouse chemistry” portion of Hunter Pence. Nobody gives better NSFW clubhouse and SFW on-field speeches. Nobody else will photobomb live shots on a scooter. Nobody pumps up the team better than Hunter Pence. Sure, he’ll be there most of the time, at least during home games. I would suspect he’ll insist on making the road trips even though he won’t be able to play for the first month of the season or so unless it interferes with rehab. Since the Giants open the season in Arizona I suspect he won’t be around for the exhibition games in the Bay Area against the Oakland A’s, but you never know. But it’s one thing to be there and another thing to be part of the action. Anyone who’s been sidelined with an injury but still part of a team knows this. You can make rousing speeches and yell “Attaboy” and be part of the home run celebrations as much as you want, but without the ability to step on the field, you’re just a cheerleader in a uniform. With the departure of Pablo Sandoval plus the injury to Pence it means a void in on-field fun for the next two months of the Giants season. I would hope that somebody else steps it up, be it new addition Casey McGehee (highly doubtful) or somebody that we don’t expect it to be, like Tim Lincecum (don’t think so) or Matt Cain (has he smiled since 2012?) or Brandon Belt (depends on his slugging percentage) or Brandon Crawford (no chance) or the Face of MLB, Buster Posey (waayyyy too serious). It would be great if the on-field fun guy is Joe Panik. It would be a perfect second act as he begins his first full season in the bigs. But it would be tough to come up with a better meme. But let’s be clear: There’s only one Hunter Pence. He’s got the championship belt to prove it. Don’t ride any scooters during rehab, fella.